Sixpence For Your Shoe: Amanda and Kyle wed at Saltwater Farm! All photos credited to the super-talent, Megan LaBarbera at Creative Image Collections. Last September, Amanda and Kyle were married at Saltwater Farm Vineyard, in Stonington, Connecticut. It was undoubtebly one of the most gorgeous September days I can ever remember. The sun shined, light fluffy clouds sailed by and the smell of salt air coming off of Wequeteqouck Cove in Stonington, Connecticut was divine. When we first met Amanda, just six months before her desired wedding date, we could see a strong sense of vision, a yearning for a wedding which would reflect both her and Kyle’s unique styles, a desire for a warm, welcoming and inviting celebration, and incorporate the importance of bringing two families together. Amanda and the girls all readied for the day at the Inn at Stonington in the center of the Stonington Borough. The sun filled room was a flurry of activity, as Noelle from Sugar Salon provided the hair styling and DD Nickel provided the make-up. Amanda selected a lace slim a-line gown with a plunging neckline by Modern Trousseau, purchased at The White Dress by the Shore. The girls wore Jenny Yoo, also from the White Dress! Upon visiting Saltwater Farm Vineyard for the first time, Amanda and Kyle’s decision was made – they loved everything about it – the mix of old and new, rustic and modern, natural and landscaped grounds and a striking reception space, once an airline hanger. Using the landscape of the vineyard and architectural details of winery, Amanda and Kyle’s wedding began to take shape. We planned for the ceremony in the vines, a cocktail hour on the patio, the reception in the Barrel Room, and then a lounge space in the wine loft. A color palette of green, purple and cream was chosen to compliment the vineyard. We choose Jane at Just For You to create all of the floral components of the wedding. Organic, natural, airy and textured, no two arrangements were exactly the same. Accenting the floral arrangements, Amanda and her father selected live plants, grasses, and mosses in rustic terra cotta pots to compliment the grounds. As guests gathered for the ceremony, a hydration station greeted them. They then made their way into the vines, listening to the background music of a duo from Wildwood Groups. When the ceremony started, Archie, the Norwich Terrier played an integral part - the ring bearer. Following the ceremony, guests were greeting to a mix of passed and stationary hors d'oeuvres all provided by Coastal Gourmet Caterers. The selections were fun and festive, with a touch of fall flair. As guests moved into the reception spaces, they were greeted to some serious eye candy! Long guest tables were selected to create the feeling of a dinner party at home and lend to more table-side discussions between guests. In addition to the floral centerpieces and moss accent pieces, the tables were accompanied by fruitwood chivari chairs with amethyst cushions, amethyst table runners, hand made by Amanda’s mother, and individual guest menus, which tied into the overall stationery suite. Warm ambiance was provided with tabletop candlelight and amber hued up-lighting. Rentals were provided by Party Rental and lighting was provided by Power Posse. Complementing the main reception space, we decorated the cozy wine loft area with oversized leather ottomans, plush pillows in green and purple and rich wooden accent tables. We rented the lounge furniture from American Furniture Rental. Guests loved the ability to escape a bit to a quieter spot, while still feeling like they were included in the overall party. Adding the personal touches, Amanda and Kyle included family pictures, cupcakes and a themed R2D2 cake for dessert, provided by Ally Cakes, as well as a s’mores bar and patio fire pit. Guests danced the night away to tunes Amanda and Kyle had selected with DJ Rob Waldron of Standing Ovations. 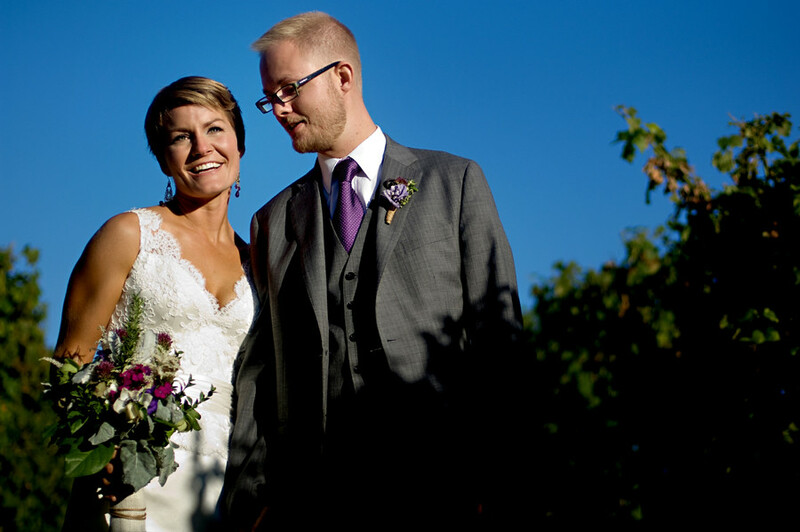 We couldn't have been happier to work with Amanda and Kyle on their gorgeous vineyard wedding. It was everything we expected and then some, and I believe Amanda and Kyle would say the same. We were thrilled to see their wedding featured on Style Me Pretty. You can find it here! Amanda and Kyle, we loved working with you and wish you all the best! Your first anniversary is around the corner and we hope this first year of marriage has been a wonderful one, filled with love and happiness.